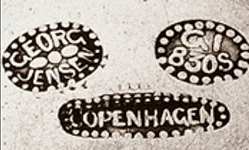 The Danish hallmarking system is organized on a voluntary base. The maker's mark and the .826 fineness mark were requested along with the "Three-tower" mark. The minimum silver standard was .826 unless a higher standard was indicated (from about 1911 Danish silversmiths began using .830 silver). 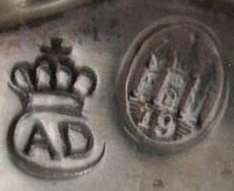 On a voluntary base, silver items could be assayed in Copenhagen and marked with the assay master's mark and the national control mark. 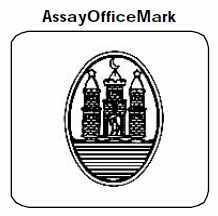 In 1988 the assay master's mark was discontinued. In 1988 Denmark became member of the Hallmarking Convention and a revised version of the national control mark was introduced. The minimum official silver fineness is .800. Mark "800" (or any other higher value as 925) may be followed by the letter "S"). In articles with silver content of at least 925 per mille silver, the fineness may solely be given the designation "STERLING" (a practice largely used for silver made for export). A slightly different version of the "three-tower" was adopted and is now in use. 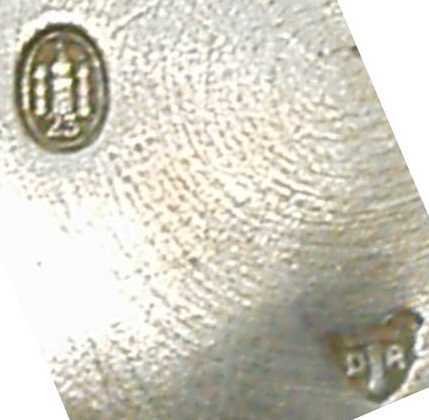 Examining the marks on many pieces of 20th century Danish silver, it becomes apparent that adherence to the marking law was either at the discretion of the maker or very lax in enforcement. Many of the larger firms such as George Jensen, Hans Hansen and Carl Cohr, rarely had official assay marks on their silverware and jewelry, no doubt these names inspired trust and their customer base did not require the added credence of state control marks. 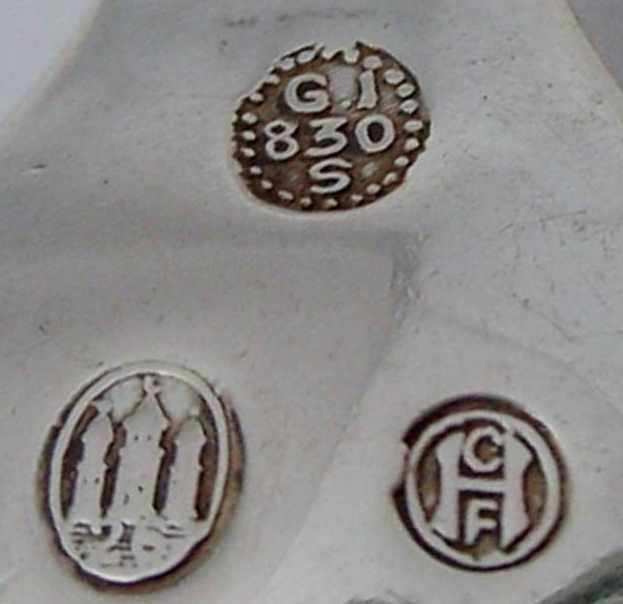 However, smaller firms and individual silversmiths did tend to follow the law, as official state marking did inspire confidence in their customers. 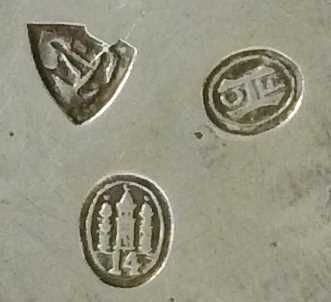 As the 20th century progressed, the official state hallmarks are found less and less, they were officially retired in 1977, it had already become common practice for pieces to be marked only with the maker's initials, 925S and sometimes Sterling and "DENMARK" as a mark of origin (in early 20th century also COPENHAGEN mark was used). A mark often present in Danish silver is the "Thor's hammer" (a god of German mythology). 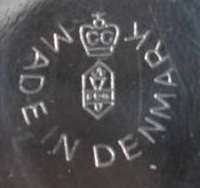 This mark is the sign of private Danish Trade Promotion Association "Landsforeningen Dansk Arbejde" (Promotions signification: "Quality Product - Made in Denmark" and "Buy Danish Quality Products") from 1908 on - with promotional activities for all kind of Danish products - not only for Silver or Plated - in Denmark and abroad. "DA" is since 2002 part of a Danish merger for Worldwide Trade Promotion. When Cohr started 1921 his plated product range in flatware and hollowware - didn't exist a nationwide symbol for this. 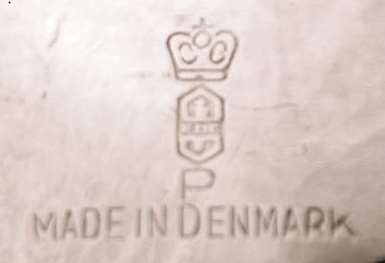 Some time later were used the letter P (in a circle, signification = Plet = Plated) and introduced the "Two towers" mark, to be used by all Danish producers of plated products. That's failed until 1929, because there wasn't any guarantee of similar quality standard. DS - Danish Standards Association Founded in 1926. Denmark's national standardisation body. DS marking is the visible evidence that a product meets the requirements laid down, for instance, in a standard covering the particular product group. 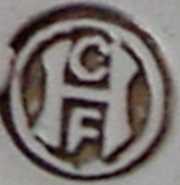 Cohr used DS marking from 1931 on. 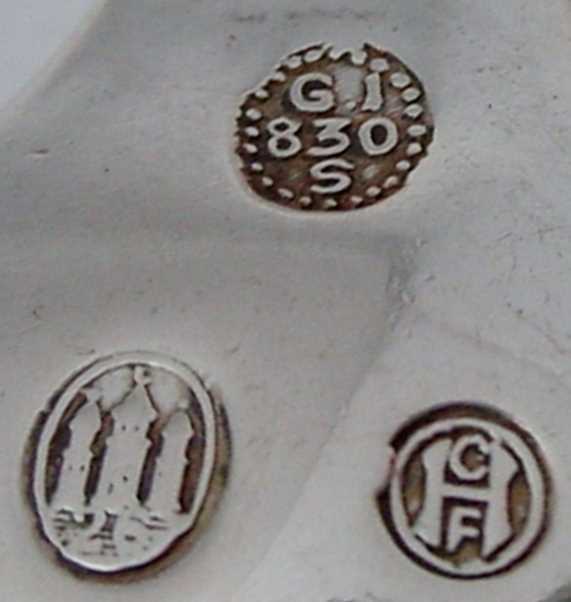 Torch mark FDG: In 1929 the "Common Representation of Danish Goldsmiths" (FDG = F�llesrepr�sentationen for Danmarks Guldsmede) registered the "Torch mark" as a trademark and wanted it to be used as a quality mark for silver plated sold by the members only. Torch mark: Quality mark for silver plated. 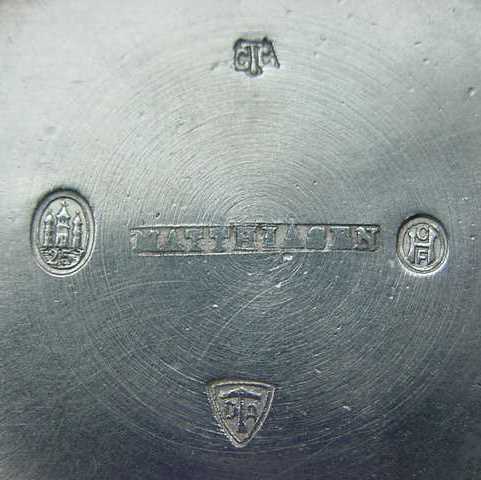 Used by the "Organisation of Silver plate Manufactures" ("Foreningen af S�lvpletfabrikanter") after they took over the rights to the torch mark from FDG about 1932. 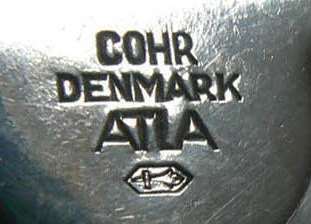 A wide array of marks was used on Cohr's silverplate. 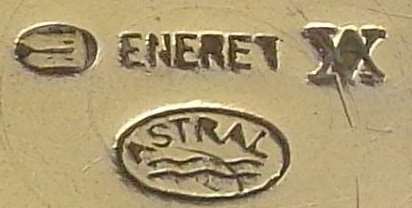 Three Stars is a symbol used in signification of "Plated" quality - from 1926 on traded as ATLA (signification: strong surface and resist use attacks) Cohr's trademark. 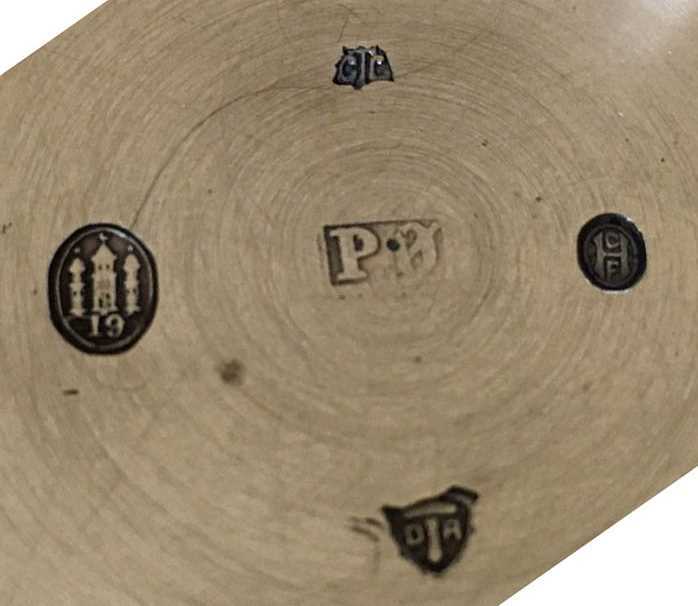 Other silverplate manufacturers use the "two-tower" mark and the "P" (Plet = Plated) into a circle.